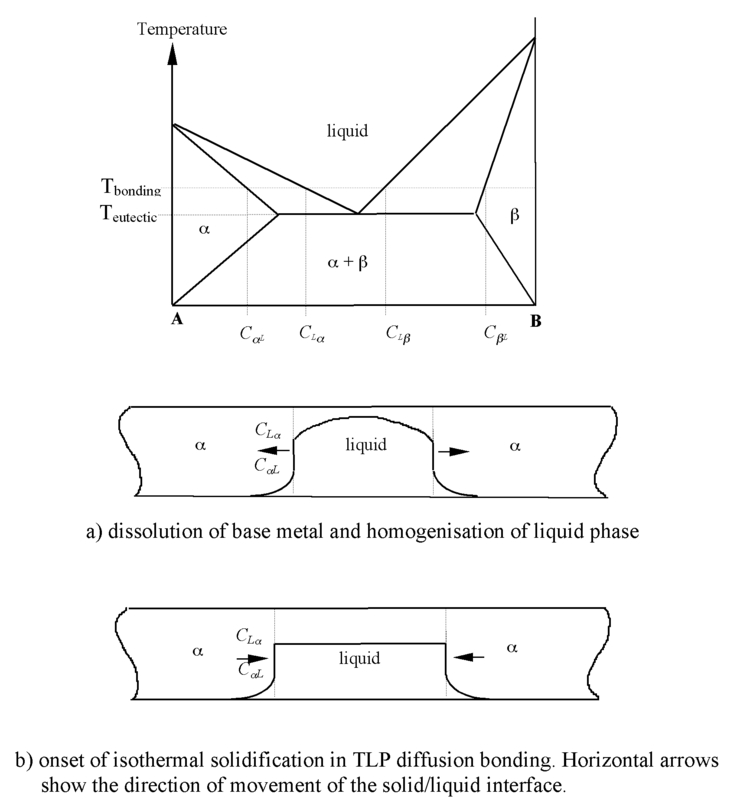 Liquid-phase welding, e.g. all fusion welding processes such as conventional arc welding, laser welding and electron beam welding. Solid-state welding, e.g. forge welding, friction stir welding, explosive welding and solid-sate diffusion bonding. In the former case, bonds are established by the formation and solidification of a liquid phase at the interface while, in the latter case, the applied pressure has a key role in bringing together the surfaces to be joined within interatomic distances. Although precise details are not known about the actual methods used by early blacksmiths and craftsmen, it is evident that solid-state welding has been used for more than a thousand years . For instance, the famous ancient Japanese and Damascus swords were made by hot forming a piece of high carbon iron into thin strips. Each strip was then folded in two halves lengthwise which were themselves again welded to each other by hammering at high temperatures. This process was repeated tens of times in order to improve the strength and toughness of the swords. Diffusion bonding, as a subdivision of both solid-state welding and liquid-phase welding, is a joining process wherein the principal mechanism is interdiffusion of atoms across the interface. Diffusion bonding of most metals is conducted in vacuum or in an inert atmosphere (normally dry nitrogen, argon or helium) in order to reduce detrimental oxidation of the faying surfaces. Bonding of a few metals which have oxide films that are thermodynamically unstable at the bonding temperature (e.g. silver) may be achieved in air. Solid-state diffusion bonding is a process by which two nominally flat interfaces can be joined at an elevated temperature (about 50%-90% of the absolute melting point of the parent material) using an applied pressure for a time ranging from a few minutes to a few hours. The International Institute of Welding (IIW) has adopted a modified definition of solid-state diffusion bonding, proposed by Kazakov . Diffusion bonding of materials in the solid state is a process for making a monolithic joint through the formation of bonds at atomic level, as a result of closure of the mating surfaces due to the local plastic deformation at elevated temperature which aids interdiffusion at the surface layers of the materials being joined. The process has the ability to produce high quality joints so that neither metallurgical discontinuities nor porosity exist across the interface. Optical micrograph of the diffusion bond in a cobalt-base superalloy, free from flaws, voids and loss of alloying elements . With properly controlled process variables, the joint would have strength and ductility equivalent to those of the parent material. 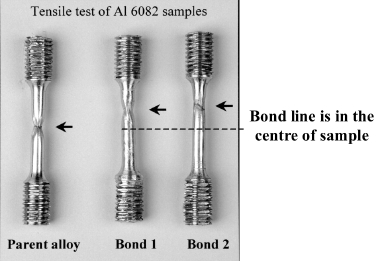 Failure of the diffusion bonded aluminium samples (bonds 1 and 2), subjected to tensile force, occurred in the parent alloy (shown by arrows) and away from the bond line. Joining of dissimilar materials with different thermo-physical characteristics, which is not possible by other processes, may be achieved by diffusion bonding. Metals, alloys, ceramics and powder metallurgy products have been joined by diffusion bonding. 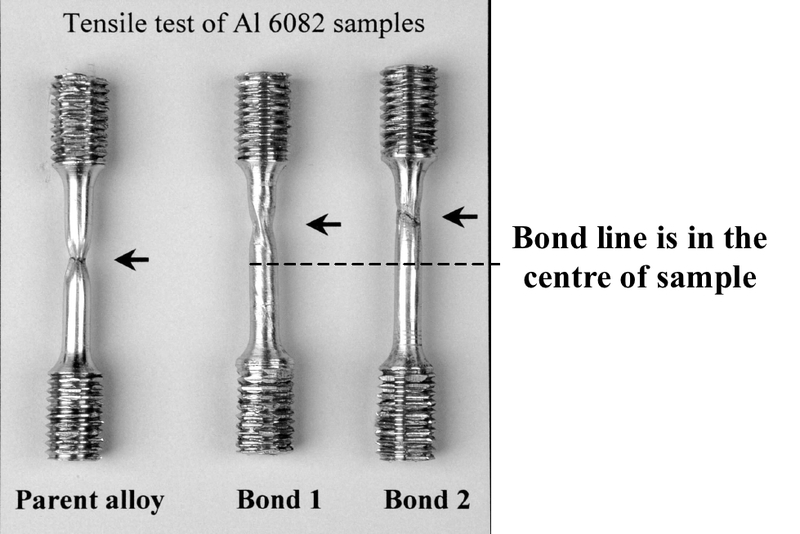 The picture shows dissimilar bonds in Al-6082 and Ti-6Al-4V tested by bending and torsion tests. No preferential failure at the joint interfaces occurred. High precision components with intricate shapes or cross sections can be manufactured without subsequent machining. This means that good dimensional tolerances for the products can be attained. 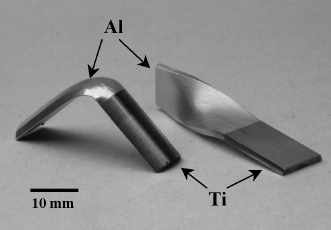 Representative high-precision components which fabricated from aluminium (left) and stainless steel (right) using diffusion bonding. Apart from the initial investment, the consumable costs of diffusion bonding are relatively low as no expensive solder, electrodes, or flux are required (although the capital costs and the costs associated with heating for relatively long times may be high). Diffusion bonding is free from ultraviolet radiation and gas emission so there is no direct detrimental effect on the environment, and health and safety standards are maintained. Great care is required in the surface preparation stage. Excessive oxidation or contamination of the faying surfaces would decrease the joint strength drastically. Diffusion bonding of materials with stable oxide layers is very difficult. Production of thoroughly flat surfaces and also precise fitting-up of the mating parts takes a longer time than with conventional welding processes. The initial investment is fairly high and production of large components is limited by the size of the bonding equipment used. The suitability of this process for mass production is questionable, particularly because of the long bonding times involved. The aim in diffusion bonding is to bring the surfaces of the two pieces being joined sufficiently close that interdiffusion can result in bond formation. There are two major obstacles that need to be overcome in order to achieve satisfactory diffusion bonds. Even highly polished surfaces come into contact only at their asperities and hence the ratio of contacting area to faying area is very low. In most metals, the presence of oxide layers at the faying surfaces will affect the ease of diffusion bonding. For some metals and alloys, their oxide films either dissolve in the bulk of the metal or decompose at the bonding temperature (e.g. those of many steels, copper, titanium, tantalum, columbium and zirconium), and so metal-to-metal contact can be readily established at the interface. The joining of these materials is relatively straightforward and is not included in this review. However, if the oxide film is chemically stable, as for aluminium-based alloys, then achieving a metallic bond can be difficult. In practice, because of inevitable surface roughness and also the presence of oxide layers on most faying surfaces, it is neither feasible to bring together the surfaces of two pieces within interatomic distances nor to establish complete metal-to-metal contact by simply putting two pieces together. See Ref. 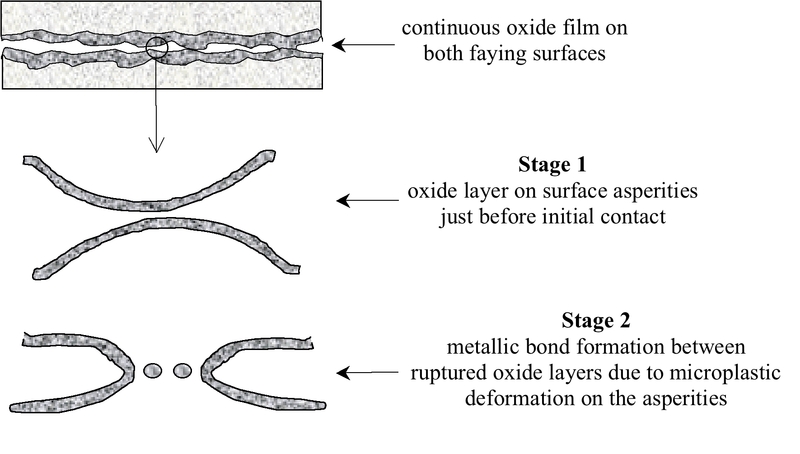 for various aspects of the effects of surface oxides on interface morphology and bond strength, and a summary of the existing approaches used to overcome the oxide problem. The mechanism of solid-state diffusion bonding can be classified into two main stages . During the first stage, the asperities on each of the faying surfaces deform plastically as the pressure is applied. These asperities arise from the grinding or polishing marks that have been produced in the surface finishing stage. The microplastic deformation proceeds until the localised effective stress at the contact area becomes less than the yield strength of the material at the bonding temperature. In fact, initial contact occurs between the oxide layers that cover the faying surfaces. As the deformation of asperities proceeds, more metal-to-metal contact is established because of local disruption of the relatively brittle oxide films which generally fracture readily. At the end of the first stage, the bonded area is less than 10% and a large volume of voids and oxide remains between localised bonded regions. In the second stage of bonding, thermally activated mechanisms (creep and diffusion) lead to void shrinkage and this increases further the bonded areas. All attempts at modelling diffusion bonding have two main aims. The first is to optimise the process variables e.g. surface finish, bonding temperature, pressure and time so that the proper bonding conditions for a particular material can be identified. Secondly, a model attempts to obtain a reasonable and profound understanding of the mechanisms involved and their relative contributions not only for different bonding conditions but also for different materials being joined. 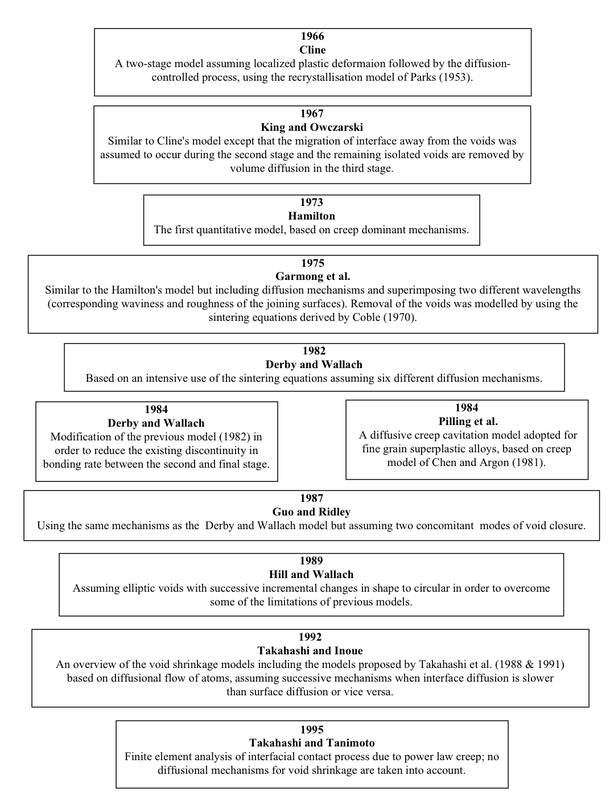 See the following chart for a chronological summary of the proposed models. The joining of aluminium and aluminium base alloys to themselves and to other metals has long created problems because of the tenacious layer of surface oxide which is always present. The difficulties become more acute when melting of the components to be joined is not an option. Shirzadi and Wallach have recently developed a technique for diffusion bonding such materials. Some advanced materials cannot be welded by conventional techniques because the high temperatures involved would destroy their properties. For such materials, diffusion bonding is an attractive solution because it is a solid state joining technique, which is normally carried out at a temperature much lower than the melting point of the material. For joining aluminium alloys, insertion of a thin copper or zinc interlayer, allows a low melting point eutectic phase to be formed at a temperature about 100°C lower than the melting point. Even with this technique, the bond strengths produced are lower than the parent metal because of the planar bond interface which contains oxides and included particles. The new technique is based on imposing a temperature gradient across the surfaces to be joined to produce a non-planar (sinusoidal) interface which effectively increases the bonding area or metal to metal interface. This is an exciting development, as it is possible to change the shape of the interface from being planar to cellular, and up to fully dendritic depending on the temperature gradient imposed. Shear test results on aluminium-based composites and alloys show shear strengths up to parent metal values. It is anticipated that this technique can be used for joining dissimilar metal combinations, metal matrix composites and possibly nickel based materials. Liquid-state diffusion bonding relies on the formation of a liquid phase at the bond line during an isothermal bonding cycle. This liquid phase then infuses the base material and eventually solidifies as a consequence of continued diffusion of the solute in to the bulk material at constant temperature. Therefore, this process is called Transient Liquid Phase (TLP) diffusion bonding. Despite the presence of a liquid phase, this process is not a subdivision of brazing or fusion welding as the formation and annihilation of the liquid phase occurs at a constant temperature and below the melting point of the base material. The liquid phase in TLP diffusion bonding generally is formed by inserting an interlayer which forms a low melting point phase, e.g. eutectic or peritectic, after preliminary interdiffusion of the interlayer and the base metal at a temperature above the eutectic temperature. Note that the liquid phase could, alternatively, be formed by inserting an interlayer with an appropriate initial composition e.g. 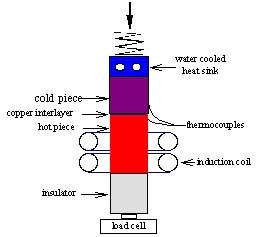 eutectic composition which melts at the bonding temperature. The diffusion rate in the liquid phase enhances dissolution and/or disruption of the oxide layer and so promotes intimate contact between the faying surfaces. Therefore, the presence of a liquid phase reduces the pressure required for TLP diffusion bonding in comparison with solid-state diffusion bonding and may overcome the problem associated with solid-state diffusion bonding of the materials with a stable oxide layer. Achieving high integrity joints with minimal detrimental effects on the parent material in the bond region and also the possibility of joining metal matrix composites (MMC) and dissimilar materials are the most promising features of TLP diffusion bonding. The picture shows a TLP bond in an aluminium metal matrix composite containing SiC particles as reinforcement. The bonding was carried out at 550°C using a 3 mm copper foil as the interlayer. The figure below shows a simple eutectic phase diagram where A represents a pure parent material and B is the diffusing solute (i.e. the originally solid interlayer) with limited solubility in A. Basically, TLP diffusion bonding consists of two major stages as follows. The dissolution stage can be divided into two hierarchical sub-stages in which filler metal melting is followed by widening of the liquid zone. However, if the melting process occurs as a result of interdiffusion of A and B, then melting of the interlayer and widening of the liquid phase may occur simultaneously. According to the phase diagram, equilibrium in the liquid can be established by dissolution of A atoms into the supersaturated B-rich liquid to decrease its concentration to CLα. During this stage, homogenisation of the liquid phase continues and the width of the liquid zone increases until the composition profile in the liquid phase levels out, i.e. diffusion in the liquid ceases. The rate of this homogenisation is controlled mainly by the diffusion coefficient in the liquid phase and, therefore, this stage takes a short time to be completed. In the next stage, isothermal solidification occurs as B atoms start to diffuse into the solid phase, and the liquid zone shrinks in order to maintain the equilibrium compositions of CLα and CαL at the solid/liquid moving boundaries. The interdiffusion coefficient in the solid phase (α) controls the rate of solidification and, because diffusivity in the solid is low, the annihilation of the liquid phase is very slow compared to the initial rapid dissolution stage for which diffusivity in the liquid controls the rate of the reaction. Singer C., Holmyard E.J., Hall A.R. and Williams T.I. (1958), `A History of Technology', Oxford University Press. Kazakov N.F(1985, English version), `Diffusion Bonding of Materials', Pergamon Press. Shirzadi A.A. and Wallach E.R (2004): A new method to diffusion bond superalloys, Science and Technology of Welding and Joining, Vol. 9, No. 1, pp 37-40. Shirzadi A.A., Assadi H. and Wallach E.R. (2001): Interface evolution and bond strength when diffusion bonding materials with stable oxide films, Journal of Surface and Interface Analysis, Vol 31, No. 7, pp. 609-618.
html version of above paper.